Generation of CTL immunity often depends on the availability of CD4 T cell help. In this report, we show that CTL responses induced by cross-priming can be converted from CD4-dependent to CD4-independent by increasing the frequency of CTL precursors. In the absence of CD4 T cells, high numbers of CTL precursors were able to expand in number and become effector CTL. The ability of high frequencies of CD8 T cells to override help was not due to their ability to signal CD40 via expression of CD154. These findings suggest that when precursor frequencies are high, priming of CD8 T cell responses may not require CD4 T cell help. Generation of CTL immunity, particularly by cross-priming, often requires help from CD4 T cells (1, 2, 3, 4, 5, 6). However, many viruses can generate CTL immunity in the absence of such helper cells (7, 8, 9). Early in vitro studies examining the cooperation between CD4 and CD8 T cells revealed a role for IL-2 as a helper factor (1). This idea was strengthened by in vivo studies showing that the provision of IL-2 could support the survival of CD8 T cells (10) or stimulate their capacity to induce autoimmunity (11). However, none of these studies provided direct evidence that IL-2 was the helper factor provided by CD4 T cells in vivo. Some doubt as to the soluble nature of help was raised by evidence that CD4 and CD8 T cells needed to recognize Ag presented by the same APC (1, 3). Although this did not exclude a role for a soluble signal, it favored the view that help is mediated via a CD4 T cell-dependent modification, or “licensing,” of the APC, as originally proposed by Guerder and Matzinger (12). Direct evidence for this licensing model was provided by three different groups including ourselves, who showed that CD4 help was mediated by signaling CD40 on the APC (5, 13, 14). In this model, the CD4 T cells recognize their class II-restricted ligand, up-regulate CD154, and then signal CD40 on the APC. Once signaled via CD40, the APC is fully licensed to prime a naive CD8 T cell. Since identification of the CD154/CD40-helper pathway for CTL induction, other alternative pathways have been reported. Several groups have provided evidence that RANK (TRANCE receptor, OPG) and RANKL can function in a similar way to CD154/CD40 for licensing dendritic cells (15). Furthermore, Pardoll and colleagues (16) provided in vitro evidence for a soluble helper factor that was not IL-2. To what degree each of these and other unidentified molecular interactions contribute to CD4 T cell-mediated help for CTL induction is unclear, but probably depends on the circumstances in which priming takes place. To better understand the requirements for help during CTL induction, we began examining the fate of CTL when cross-primed by OVA-coated spleen cells (17) in the absence of help. To do this, we used the OVA-specific CD8 T cells from OT-I transgenic mice (18, 19) to follow naive precursors primed in the absence of help. To our surprise, these precursors were able to respond normally to priming in the absence of CD4 T cells, leading us to discover that the CTL precursor frequency dramatically affected the dependence on CD4 T cell help. All mice used were between 6 and 12 wk old, and were bred and maintained at the Walter and Eliza Hall Institute for Medical Research (Parkville, Victoria, Australia). Rag-1-deficient OT-I mice (20) and class II-deficient mice (21) have been described. Rag-1-deficient OT-I mice have been back-crossed to C57BL/6 eight generations. CD154-deficient OT-I mice were generated by intercrossing OT-I and CD154-deficient mice. These mice were three to nine generations back-crossed to C57BL/6. Ly5.1 congenic OT-I mice were generated by intercrossing OT-I and Ly5.1 congenic C57BL/6 mice. For priming mice with cell-associated OVA (17), bm1 spleen cells (2 × 108/ml) were incubated with 10 mg/ml OVA for 10 min at 37°C. Cells were washed, irradiated for 1000 rad, and after two more washes, 20 × 106 cells were injected i.v. into mice. The cells used to prime were referred to as OVA-coated spleen cells. OT-I cells were prepared as described (22, 23). Briefly, OT-I cells were derived from the spleen and lymph nodes of Rag-1-deficient OT-I mice. Cells were treated with RL172 (anti-CD4) and J11d (anti-heat stable Ag) for 30 min on ice, centrifuged, and then depleted by treatment with rabbit complement for 20 min at 37°C. Prepared cells were examined by flow cytometry for the proportion of Vα2+CD8+ cells to determine the number of OT-I cells for adoptive transfer. CFSE-labeling was performed as previously described (24). Briefly, semipurified OT-I cells were resuspended in PBS containing 0.1% BSA (Sigma Aldrich, St. Louis, MO) at 107 cells/ml. For fluorescence-labeling, 1 μl of a CFSE (Molecular Probes, Eugene, OR) stock solution (5 mM in DMSO) was incubated with 107 cells for 10 min at 37°C. Cells from pooled lymph node and spleen were stained using the following mAbs: PE-conjugated anti-CD8 (YTS 169.4; Caltag Labortatories, San Francisco, CA), FITC-conjugated anti-Vβ5.1/2 TCR (MR9-4; Ref. 24), and biotinylated anti-Vα2 TCR (B20.1; Ref. 25). mAbs were conjugated to biotin or FITC using standard protocols. Biotin-labeled mAbs were detected with streptavidin-Tricolor (Caltag Laboratories). Analysis was performed on a FACScan (BD Biosciences, Mountain View, CA). Live gates were set on lymphocytes by forward and side scatter profiles. A total of 10,000–20,000 live cells were collected for analysis. OT-I T cells were identified as CD8+, Vα2+, and Vβ5+. This proportion in a noninjected recipient was <2%. CD8+, Vα2+, and Vβ5+ T cells above this background were considered to be OT-I T cells. OVA-specific CTL were generated as previously described (3). Briefly, B6 mice were primed with OVA-coated spleen cells. After 7 days, spleens were removed and single cells were cultured with 108 1500 rad-irradiated OVA257–264-coated B6 spleen cells for 6 days. Cytotoxicity was assessed in a conventional 51Cr-release assay using the H-2b cell line EL4 with and without OVA-peptide-coating as targets. The percentage of OVA-specific lysis represents the lysis of peptide-coated EL4 minus the lysis of EL4 alone, i.e., peptide-dependent lysis. Lysis of unlabeled EL4 targets was <10% in all experiments. Lytic units were calculated by determining the minimum number of effectors required to generate 20% OVA-specific lysis and then dividing this into the total number of effectors generated per responder spleen. Staining for intracellular IFN-γ was performed as previously described (26). As previously reported (17), B6 mice can generate OVA-specific CTL when primed with irradiated spleen cells either osmotically loaded or coated with whole OVA. This response is mediated by cross-priming, where host APC capture donor cells and cross-present associated OVA on both class I and class II molecules. Generation of CTL by this type of priming is CD4 dependent, and therefore cannot be achieved in class II-deficient mice (Fig. 1⇓; Ref. 13). This observation prompted us to examine the fate of precursor CTL primed in the absence of help. Class II-deficient mice cannot be cross-primed with OVA-coated spleen cells. B6 mice (•) or class II-deficient mice (○) were immunized i.v. with 20 × 106 irradiated OVA-coated bm1 spleen cells. CTL activity was determined as described in Materials and Methods. The percentage of OVA-specific lysis represents the lysis of peptide-coated EL4 minus the lysis of EL4 alone, i.e., peptide-dependent lysis. The data shown are representative of four experiments with one mouse per experimental group. First, we examined whether in the absence of CD4 T cells, CTL precursors would recognize Ag and become sufficiently activated to undergo division. To do this, we transferred 2 × 106 CFSE-labeled OT-I T cells into class II-deficient recipients (CD4 T cell deficient), and assessed their ability to proliferate in response to priming with OVA-coated spleen cells. Fig. 2⇓ demonstrates that the OT-I T cells were capable of Ag-specific division, in the absence of a helper T cell population. 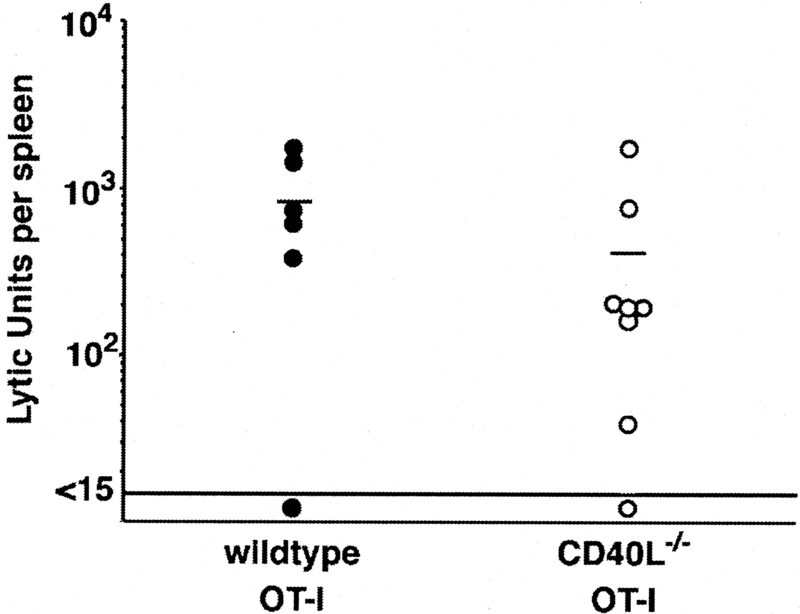 OT-I cells divide in response to Ag in the absence of CD4 T cells. C57BL/6 mice or class II-deficient mice were injected i.v. with 2 × 106 CFSE-labeled OT-I cells. The following day mice were immunized i.v. with 20 × 106 irradiated OVA-coated bm1 spleen cells. Three days later, these mice were killed, and their spleen cells were analyzed by flow cytometry. Profiles are gated on CD8+, CFSE+, and propidium iodide-negative cells. The data shown are representative of five experiments with two mice per experimental group. The ability of OT-I T cells to proliferate in response to Ag, independently of CD4 help, prompted us to examine whether this was accompanied by an expansion in number. To do this, 2 × 106 OT-I cells were transferred into class II-deficient recipients and the fate of the cells determined following cross-priming. The experiments shown measured the number of OT-I cells present at 2 wk after priming. However, similar results were also observed at 1 or 6 wk. Fig. 3⇓, A and B, indicates that both normal and class II-deficient hosts showed an equivalent increase in the number of OT-I cells after cross-priming. The expansion of OT-I cells in class II-deficient mice was surprising, and had two alternative explanations: either 1) expansion was not accompanied by differentiation into effector CTL and the mice were still functionally unprimed, or 2) expansion was indicative of priming, and the behavior of these OT-I cells was different from that of a normal repertoire. OT-I cells can be primed in the absence of CD4 T cells. C57BL/6 mice (A) or class II-deficient mice (B) were injected i.v. with 2 × 106 OT-I cells. The following day mice were immunized i.v. with 20 × 106 irradiated OVA-coated bm1 spleen cells. The number of CD8+Vα2+Vβ5+ cells in the spleen and peripheral lymph nodes was determined by flow cytometry 14 days after priming. The data presented were obtained from three separate experiments with two to three mice per group. C, Class II-deficient mice were injected i.v. with 2 × 106 OT-I cells (•). The following day, these mice were immunized i.v. with 20 × 106 irradiated OVA-coated bm1 spleen cells, or left untreated (○). CTL activity was determined as described in Materials and Methods. 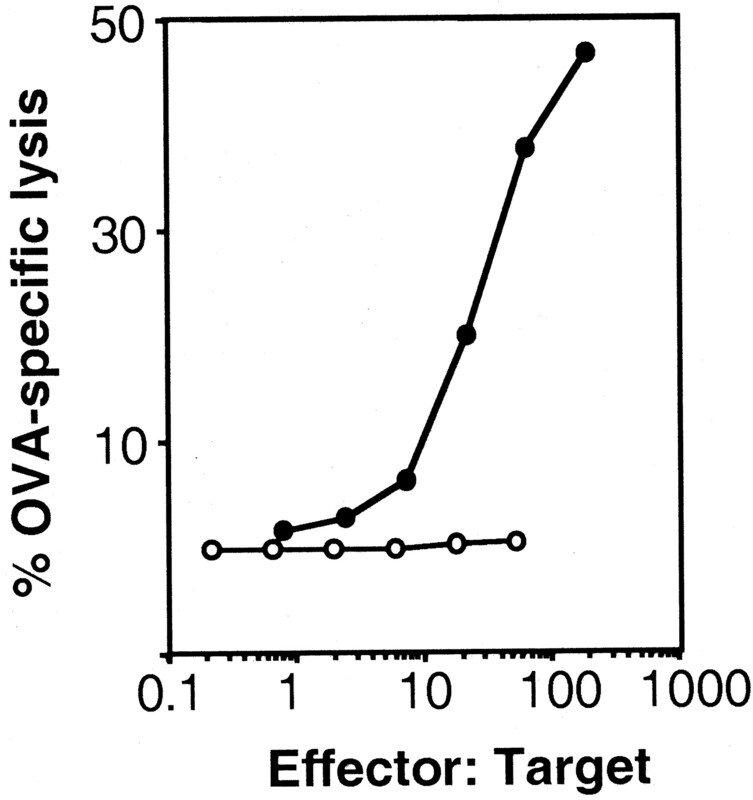 The percentage of OVA-specific lysis represents the lysis of peptide-coated target cells minus the lysis of target cells alone, i.e., peptide-dependent lysis. The data shown are representative of four separate experiments with two to three mice per experimental group. To distinguish between these two possibilities, we examined the differentiation status of OT-I cells in primed class II-deficient mice. Class II-deficient mice were adoptively transferred with 2 × 106 OT-I cells and then either left unprimed or primed with OVA-coated spleen cells. Seven days later, spleen cells from these mice were restimulated for 6 days in vitro and their ability to lyse 51Cr-labeled target cells was assessed (Fig. 3⇑C). Comparison of the response from primed vs unprimed mice revealed that OT-I cells transferred into class II-deficient mice were primed. Thus, along with expanding in number, the OT-I cells differentiated normally after priming, despite the absence of CD4 T cell help. The above data indicated that adoptively transferred OT-I cells could be cross-primed in the absence of CD4 T cell help. There were two main explanations for why these transgenic cells were no longer helper dependent: either 1) OT-I cells were helper independent because they represented a very high affinity CTL, or 2) the presence of a large number of CTL precursors converted a helper-dependent response into a helper-independent response. To address this issue, class II-deficient mice were injected with 10-fold decreasing numbers of OT-I cells, from 106 to 104 cells, and then primed and assessed for CTL activity (Fig. 4⇓). As shown, class II-deficient mice only generated CTL immunity when reconstituted with 106 OT-I cells. Because 105 OT-I cells are detectable by flow cytometry using tetramer-staining, but we cannot detect OVA-specific cells in a normal naive repertoire (data not shown), this number of OT-I cells must vastly out-number the normal frequency of precursors. 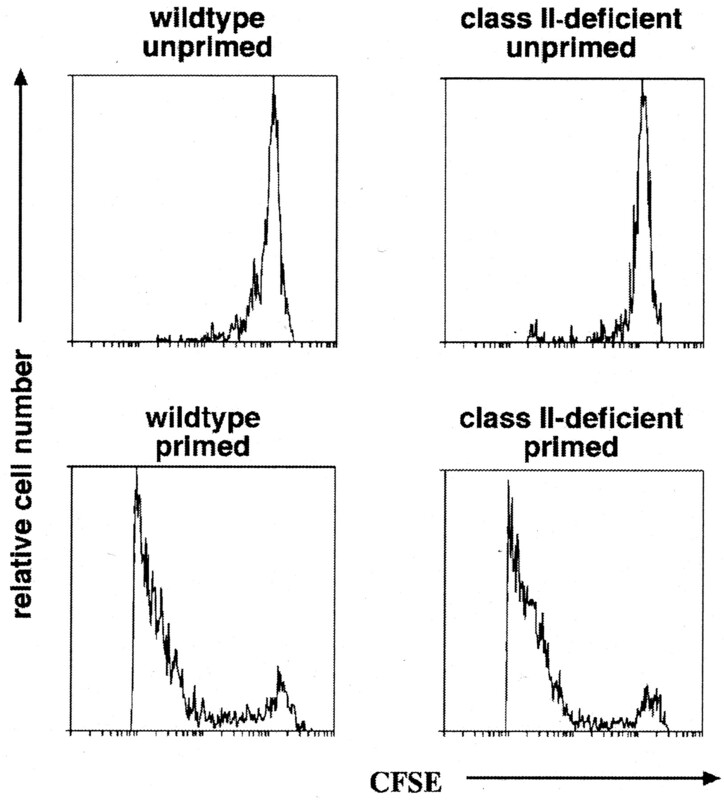 Failure to detect priming at this frequency indicates OT-I cells do not have a special property that allows them to be primed in the absence of help, but rather it is the high precursor frequency achieved when 106 cells are transferred that enabled helper-independent priming. The frequency of OT-I cells affects their helper dependence. Class II-deficient mice were injected with 106 (○), 105 (▵), or 104 (□) OT-I cells. The following day, the mice were immunized i.v. with 20 × 106 irradiated OVA-coated bm1 spleen cells. A C57BL/6 control which did not receive OT-I cells was also immunized (•). CTL activity was determined as described in Materials and Methods. 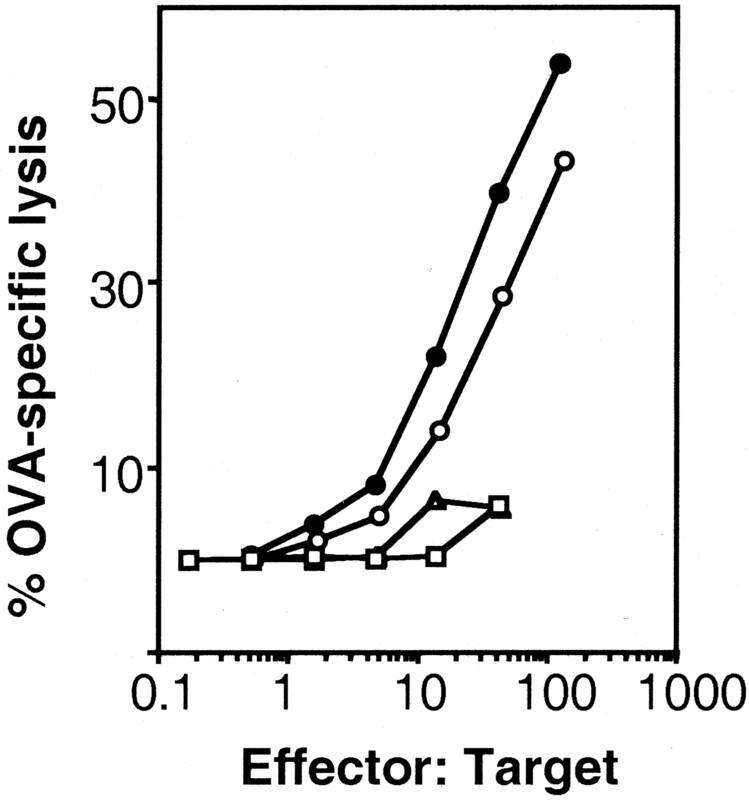 The percentage of OVA-specific lysis represents the lysis of OVA peptide-coated target cells minus the lysis of target cells alone, i.e., peptide-dependent lysis. The data shown are representative of three separate experiments with one to two mice per experimental group. As we and others have reported, CD4 T cells provide help for CTL via the expression of CD154, which signals CD40 on the cross-priming APC, converting it into a cell capable of CTL priming (5, 13, 14). We wondered whether large numbers of OT-I cells might provide their own help via expression of CD154, particularly since CD154 has been shown to be expressed by a minor population of CD8 T cells (27, 28, 29). This has been demonstrated to contribute to CD8 T cell expansion in mucosal tissues (30). To test this possibility, OT-I mice were backcrossed to CD154-deficient mice, and their ability to generate CTL immunity was examined. Like wild-type OT-I cells, high numbers of CD154 knockout OT-I cells were able to generate helper-independent CTL responses (Fig. 5⇓). Therefore, the ability of OT-I cells to overcome the requirement for help at high doses is not mediated via CD154. The ability of high numbers of OT-I cells to be primed in the absence of CD4 T cell help is not dependent on CD154 expression. Class II-deficient mice were injected i.v. with 2 × 106 OT-I or CD154-deficient OT-I cells. The following day, mice were immunized i.v. with 20 × 106 irradiated OVA-coated bm1 spleen cells. CTL activity was determined as described in Materials and Methods. Each point represents an individual mouse and the bar represents the mean within that group. Fifteen lytic units was the minimum detectable response. Nonresponders are represented by points below the line drawn at 15 lytic units. The data shown are representative of four separate experiments with one to two mice per experimental group. The data presented above support a model where the helper dependence of CTL responses can be strongly influenced by the frequency of naive CTL precursors. When frequencies are low, help is critical, but as the number of precursors increase, CTL immunity becomes helper independent. The ability of CD8 T cells to provide their own help at high precursor frequencies is consistent with a report that CD8 T cells can cause DC maturation (31), and the observation that CD8 T cells can boost the response of other CD8 T cells under some circumstances (32). In this study, we do not observe an essential role for a CD154 signal in the mechanism by which CD8 T cells help themselves. Perhaps the simplest explanation is that while single CD8 T cells are unable to make sufficient cytokines to facilitate their own expansion, multiple clones together might achieve local threshold concentrations. Whatever the reason for helper independence at high frequencies, our report provides a potential explanation for some of the variability in the helper dependence of CTL priming with different immunogens. If an immunogen is complicated, and therefore contains multiple CTL epitopes, then the frequency of CTL precursors may be high, and the response helper independent. This could, for example, apply to some anti-viral responses that appear to be helper independent (7, 8, 9). In contrast, if the immunogen is simple and contains few CTL epitopes, such as the case for OVA, then responses will most likely require CD4 T cell help (Fig. 1⇑ and Ref. 13). The data presented in this report highlight the dramatic effect of frequency on the helper dependence of CTL. This report also highlights the issue that examination of naive CTL using high frequencies of TCR transgenic T cells must consider the potential contribution of increased frequency. We thank Tatiana Banjanin, Freda Karamalis, Loretta Clovedale, and Annette Alafacci for their technical assistance. ↵1 This work was funded by National Institutes of Health Grant AI43347-01, the National Health and Medical Research Council of Australia, the Cooperative Research Centre for Vaccine Technology, and a Howard Hughes Medical Institute International Fellowship.